Unmanned aircraft might be taking the world by a storm, but we don’t mean that in a nefarious way. No, weaponized drones aren’t going to wreak havoc on the American populace. No, you can’t fly a drone anywhere you want. Yes, it takes a certain amount of skill and knowledge to know how to effectively pilot and maneuver a drone. Our point? 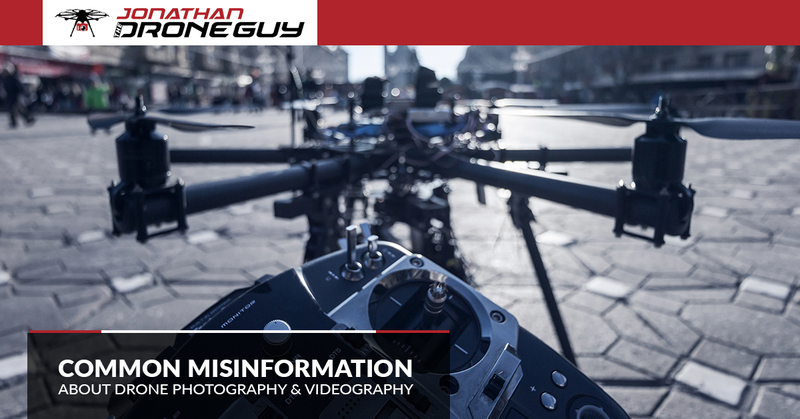 There’s quite a lot of misinformation flying around out there pertaining to drones, and, as a drone expert himself, Jonathan The Drone Guy is here to help set the record straight. If you’re looking for drone service in Los Angeles to shoot music videos, market your real estate listing, survey land for commercial development, capture your wedding from a unique angle, and so much more, Jonathan is your guy. Turn your ideas into breathtaking video or photos by reaching out and getting a quote from Jonathan today! Read below as we must a few of the most common drone-related myths. If anyone could fly a drone, then why aren’t there more competitors when it comes to drone video and drone photography services? Not only is controlling an unmanned flying device a lot trickier than you’d think, but FAA-licensing is also an important part of being a legitimate and trusted drone pilot. Insurance also matters; Jonathan is insured up to $2 million for every shoot that he does. Sure, flying a drone camera around probably looks fairly easy and simple, but navigating expensive equipment without hitting any obstacles is more nerve-wracking than you’d think (fortunately, Jonathan is a true professional). Basically, be safe, sensible, and responsible when you fly your drone. Not true. While curious travelers are likely to bring a drone or some other specialized camera with them to properly document a trip to somewhere exotic, you don’t need to do so just to capture great footage. Heck, you could be in your backyard and get a view of your subdivision that most people probably haven’t seen. It doesn’t take a majestic waterfall in Iceland to get a unique angle on things (though it does take a drone to get that characteristic aerial view). Turn Your Creative Ideas Into a Reality Through Jonathan’s Drone Video Services! Not a drone pilot? That’s completely fine because Jonathan The Drone Guy is your drone guy. From real estate drone photography in Los Angeles to drone wedding photography in Pasadena and so much more, Jonathan is ready to help. Contact him today!